We live in a world where technology is critical to almost everything we do, and as such, engineers must take their rightful positions as leaders. 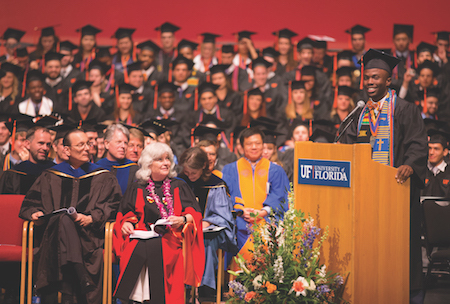 The Engineering Leadership Institute at the University of Florida is preparing a diverse student body to work across disciplines and to step into leadership roles. For the United States to lead the global innovation economy, our engineers must take their rightful place as leaders in all aspects of society – in industry, education, government, and the military. Classes offered through the Engineering Leadership Institute produce the principles-based, character-focused leaders urgently needed by our country and the world. The University of Florida is one of the nation’s largest public universities, and the Herbert Wertheim College of Engineering is it’s largest professional school – offering one of the most dynamic engineering programs in the country. Nine departments, 15 degree programs, and more than 20 centers and institutes within the college help produce problem-solvers who take a multidisciplinary approach to innovative and human-centered solutions. The Engineering Leadership Institute plays an integral role in educating what we call the New Engineers – those who will transform the way we live, work and play. The Engineering Leadership Institute provides engagement, education, experience, and an expectation – of our students, faculty, and the engineering profession itself – that we should at all times embody a focus on integrity and character, no matter what role we might play.